The tide has turned, taking the red from my sea. The scarlet has faded to persimmon and apricot. At least it has on the flame tree that had the orange cast*, as I pointed out in this post. You can see the color difference better on the bottom left photo of this series. And yes, that is the color of the sky, and not because it is sunset. Vive l'air pur de Caire! I think next year, we will plan our vacation time to coincide with summer here. 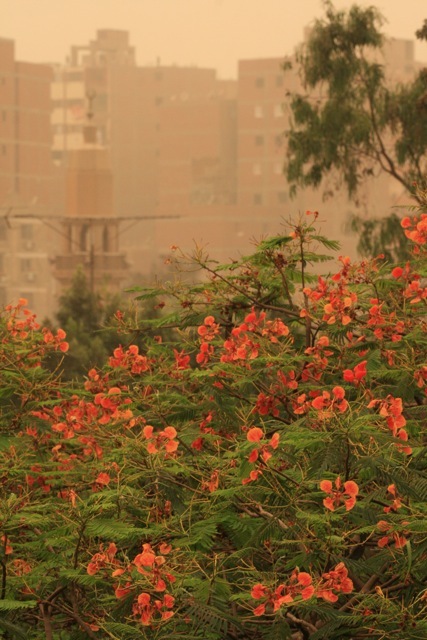 I think Cairo in summertime is going to be very like Paris in August: Everyone who can leave leaves. 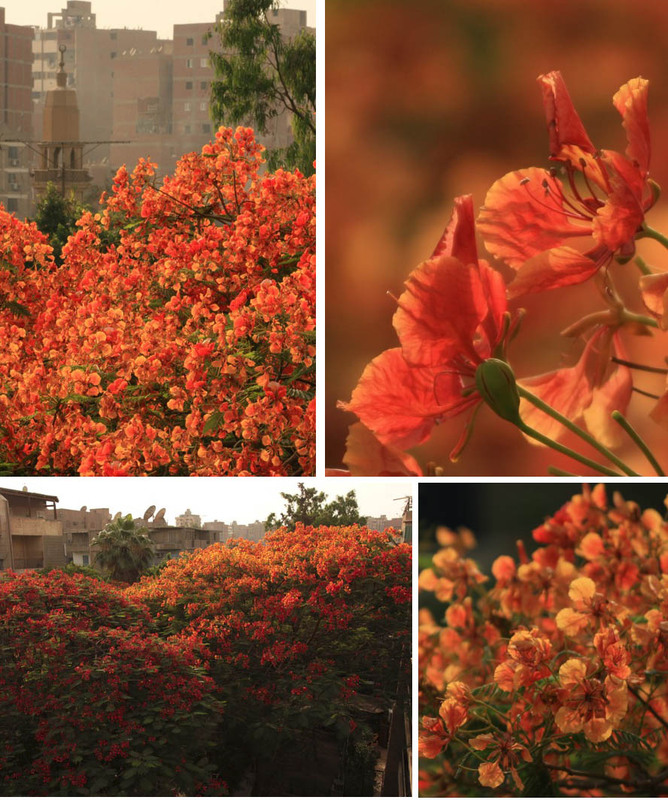 *When the trees were at their best, I preferred the deeper red one, but its flowers, instead of fading, simply shrivel and die, while the vermillion blossoms seem to have a longer lifespan. Seriously... I can't imagine it. How do those who *can't* flee stay alive? .... and now I want to eat a persimmon. Mmmmm. They have them in Japan. And how much harder it is to live when the power goes out during such heat spells. "Goes out" make it sound like an accident, but I'm talking about planned power cuts. Everyone is very thankful to Morsi for those, let me tell you. On the 123.8 degree day, our little family took refuge in a shopping center--guaranteed electricity and cooling--but a friend of ours stayed home with her little girl and had to cope with 5 rolling black-outs. When we got home, our power was out, too, so I'm glad we spent most of the day elsewhere. My volunteer information packet tells me that Ainaro (the town in East Timor where I'll be) has electricity pretty much all the time now--an improvement from before, and, apparently, an improvement over lots of countries that are supposedly more developed! What about beggars and street people, people who live without electricity? Do they go into the shopping centers too? I don't know. I didn't see any. But I know that there are water stations all over the city, so that people can drink (they are out and supplied year-round). I plan on doing a picture post about them. I also love that persimmon & apricot color...and fruits, for that matter. I echo F's comment on how people can live in 51C temps! My friends in India told me the other day it was 47C and, even if they are used to it, they were suffering. One friend had to drive 200 plus kilometers that day and the engine was overheating, the air conditioning was useless, & everyone in the car was sweating & wilting! :( My friend's family had to suffer being bitten by mosquitoes to sleep several nights up in their rooftop balcony where it was a bit cooler. People have lived like that, with heat like that, for centuries. I don't comprehend how people could have survived, for instance, in the New Orleans of the early 1700s, but they demonstrably did (in their fine heavy clothes and all!). And I'm often grateful that we don't have these temps with Mayotte's humidity. I would be a puddle right now. I visited Cairo for a few days, but it was during Ramadan and cooler. The air was pretty polluted even 20 years ago.